Select an Owens Corning Total Roofing Protection Package to provide your home with unmatched protection up to 50 years. All Owens Corning roofing systems feature dozens of shingle types, colors, and styles to choose from. Protect your home with heavy duty seamless gutters and downspouts. Our gutter products are custom-made to create the perfect look for your home. With over 38 years of industry experience, our consultants are well-versed in selecting the right system for your roof setup. Are clogged gutters causing damage to your home? Put that ladder away and let America’s #1 choice for gutter protection keep your gutters clear and free-flowing year-round. 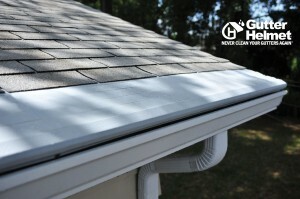 With Gutter Helmet, we guarantee you will never clean your gutters again! Serving the greater Philadelphia and New Jersey areas, including Wayne, Abington, Buckingham, Doylestown, Norristown, Morrisville, West Chester, Kennett Square, King of Prussia PA, Newark DE and more. We also serve Pittsburgh, PA.
Are you tired of climbing a dangerous ladder to clean out your gutters? Worried about the increasingly common snow storms that pummel Philadelphia communities and threaten to destroy your home’s rain gutters? Call the greater Philadelphia gutter guard experts at HarryHelmet®. Our local Philadelphia gutter dealer can install the Gutter Helmet® gutter guard system so you can sleep easy knowing that your gutters will remain free flowing at all times, stand up to heavy snow and ice, and keep your home’s facade and foundation protected from ineffective gutters. Our professionally certified team of installers have performed thousands of new gutter and gutter guard installations. See what some of our satisfied customers have to say. Read some gutter guard reviews. Learn more about Gutter Helmet® benefits. And then contact us or sign up online for a free estimate today. There are plenty of imitators out there, but Gutter Helmet® has been installed on millions of homes across the country, and is the best choice for Philadelphia homes. Gutter Helmet® Philadelphia serves the greater Philadelphia communities, including Chester, West Chester, Lower Merion, Bensalem, and Newark DE.